Although VoIP or Voice Over Internet Protocol transmission began in the early 70s and the first internet phone software appeared in the mid-90s, it seems that VoIP technology is still a bit of a mystery to many small businesses. It's not so surprising given the fact that most small business owners still consider technology as something secondary to their business and clients and are, therefore, not completely familiar with all innovations. And who could blame them, right? Technology of the second half of the 21st century became a true monster, with amazing innovating solutions appearing almost on a daily basis. Plus, VoIP technology today (like any other) isn't what it was 10 or even 5 years ago, both in terms of quality and cost. Namely, back in the day (and we don't mean during the 70s or 90s, but some 5-10 years ago), such an infrastructure wasn't very common, and therefore, not affordable. However, high-quality and high-tech IT infrastructure today is something that is more or less attainable for most businesses regardless of the size. The only trick is to find the right solution. So, why would you, an owner of any business, decide to switch form a landline to a VoIP phone? We won't just say: "Well, because it's 2018 and everything is on and done over the Internet" because we are sure that that's not a good enough reason. Internet desktop phones are probably not your top priority considering all the things you have to deal with every day to keep your business up and running. We'll give you clear reasons why VoIP is the best phone solution for small business and we'll show you how your business can benefit from adopting the VoIP technology. Perhaps you know how VoIP works and perhaps not. If you don't, we'll avoid the complicated IT mumbo-jumbo and try to help you understand the basics. The simplest explanation would be: VoIP calls are Internet calls – made and received over a broadband Internet, which is, as you might assume, the main difference between landlines and these VoIP phones. If you want a bit more detailed explanation, it would sound something like this: with VoIP, the analog voice calls are converted into data that travels like any other data these days – over the Internet, either public or private (internal) network. VoIP phones look very much like some good-old landline business phones, but they are not. They have a handset and they are placed on your desk, but they are actually small computers with their own processors and other computer components inside, that just look like regular phones. Having a phone call doesn't mean that you can only communicate with other internet phones. It means that you can call landlines or cell phones and receive calls from such devices. Important to mention right away that there are still people out there who are worried about the call quality, as VoIP technology uses the internet for communication. If you are one of those people, you should know that long gone are the days of poor quality, call disruptions and weird noises that internet once had. VoIP phones today have a crystal-clear sound, you might say, even clearer and better-quality sound than the landlines or cell phones have. As for the advantages of a VoIP phone system, they go far beyond the costs, but the costs are a good place to start from in case you are wondering if you should finally retire your good-old landline. Landline is very expensive – usually 40-80%. The calls are charged per minute for both domestic and international calling. The bills change depending on the taxes, fees, going over on minute, etc. Features such as caller ID or call waiting are charged additionally and can almost double the bill. In case your business relies heavily on the telephone communication, landlines will soon prove to be a ridiculously expensive and wrong choice. On the other hand, VoIP is very inexpensive. The domestic calls are usually included in most plans, while international calls are charged as low as $0.02 per minute. Besides, with VoIP phones you'll have the convenience of having everything in a digital form, including contracts, plans and bills. Landline phone has its fixed location and cannot be moved. Portable phones are also limited by the range and charging of batteries. VoIP, on the other hand, is very much mobile. A cloud-based phone can be taken literally anywhere where an internet connection exists. Plus, with a VoIP phone adapter, you bring your phone number everywhere with you - to a hotel room where you'll plug it in a landline and use your VoIP number. Another advantage of VoIP phone system over a landline is the routing ability. Call-forwarding option is very valuable, because it enables you to route all calls coming to your office to your cell phone during the office closing hours or if no one picks up the phone after certain number of rings. How Can VoIP Help My Business? 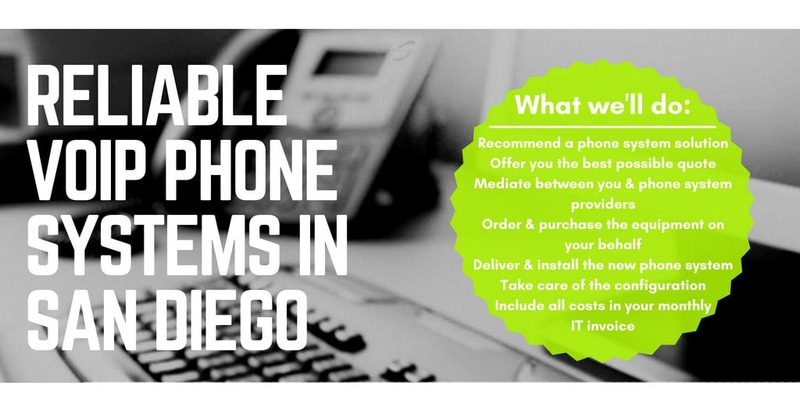 There are two options to choose from when it comes to a VoIP business phone. You'll need to either get a cloud-based phone server or a physical phone server for the phones to work. Each phone solution has its benefits and downsides and the choice will primarily depend on the size of your business and the number of employees, i.e. extensions. The main benefit of a cloud-based phone server is that it gives you all the amazing benefits of a cloud. When in cloud, you won't need to worry about anything but a reliable internet connection, so choose your internet provider carefully. The cloud-based phone system provides all the benefits of the cloud and those benefits are not something to be taken lightly. The three most important ones would be: 24/7 access anytime, anywhere, 99.9% uptime and maintenance that you won't be responsible for. Let's start with what will probably concern you the most as a business owner – maintenance. The maintenance is completely taken care of by the provider, so it won't be your responsibility. This means that you won't need to have an in-house technician and you won't need to hire another company to take care of the phone server. Plus, you won't need an expert to add or remove extensions either, as that something that you'll be able to do yourself. Secondly, cloud phone server providers guarantee 99.9% uptime, which is not something most small businesses can achieve. The fact that the cloud is always available means that you'll have 24/7 access all year round. And any time your office internet goes down, you'll be able to take your VoIP phone home or wherever, plug the phone in internet and you'll instantly have access like nothing happened. Your hands won't get tied in case your office internet lets you down. Besides, a lot of VoIP phone systems providers offer apps that you can install on your smart phone. If the internet goes down, you can make and receive call from your cell phone. Another benefit for all you small business owners who are trying to minimize expenses and stay within the budget is that you'll be able to pay as you go. If you hire a new employee, you'll pay for an additional user starting next month. If an employee leaves, you'll just stop paying for that employee. This will provide more control and enable you to avoid all unnecessary costs. The only downside of the cloud-based phone server would be the eventual overall cost. Namely, the solution is paid on a monthly basis per user, so it completely makes sense for a small business with up to 10 employees. You'll pay about $15-$50 per user, which means that 10 users will cost you about $500. However, if your company has more than 10 employees, a physical server will start to make more sense in the long run, regardless of the high initial cost. High mobility – Take your business phone with you to any internet connection as you'll continue to make and receive calls as if you're still in the office. Can become expensive – Cloud solution becomes progressively expensive as you add more users to your team. On the other hand, a physical phone server will start to make complete sense in case your business has more than 10 users. Although the initial cost might seem like a lot of money to invest at once, keep in mind that that would be the only time that you'll be paying for it and that you'll become its owner after you make the purchase. This solution will certainly pay off in the long run, especially if the number of your employees continues to grow. For example, phone system with 8 VoIP phones will cost you about $3000, while 24 phones amount to about $7500. It's clear to see that paying for more than 10 extensions on a monthly basis will pretty soon surpass the initial investment. Some other benefits of the physical phone server might seem as downsides at the same time, and those will be determined by the exact size of your company and its budget. For example, if you decide to go with this server, you'll need to hire an in-house IT expert to take care of the maintenance and adding extensions, which is another employee on your payroll. Or, in case you are not ready to hire your own IT guy, you'll need to hire an external company that will completely take care of the phone server for you. Not a problem for larger enterprises, could be a problem for smaller mid-size businesses. You'll also need to keep in mind that the physical phone server takes up some space, so you'll need to find a place for it in the office. The server itself is not very large, but you'll still need to figure out where to put it. Again, not a problem for larger enterprises, might be an issue for businesses with limited office space. Also, what seems to be a downside of a physical phone server when compared to cloud-based one, is that your phones will stop working when your internet goes down. Your staff members will be able to use the phones for in-house communication, but they won't be able to make or receive calls from outside the company. You won't have the option to move your phone to a location with a working internet connection or to transfer the calls to your phone. But hey, high-speed internet providers are constantly battling to get on top, so chances are good your internet issues will become unnoticeably rare. How to Set up VoIP for Business? Setting up a VoIP for your business will primarily depend on whether you are migrating from a landline or not. If your office has a landline, you'll first need to contact your current phone company and check how your existing number can be transferred to a VoIP solution. Then you'll need to choose and consult your new VoIP provider regarding a DID number. DID or Direct Inward Dialing number is a virtual number that will allow you to route all calls to your current telephone lines. With DIDs, calls can be routed to an unlimited number of extensions while you are able to maintain just one DID number. If the transfer is possible, your number will be transferred into DID number, you'll be connected to their server and you'll start using your new VoIP phones. Regardless of the option you are leaning towards to, important is to know that you won't have to make such an import decision on your own. We get you – technology can be confusing, and that is completely normal. Hey – you might be performing brain surgeries, or you might be a tax-wizard, or you might run a successful tools and supplies company. Which is amazing, but it doesn't require you to know technology. That's why we're here! To take care of your entire IT infrastructure, so that you are free to exceed in your line of work. Secure Networks ITC has more than 15 years of experience with San Diego small to mid-size business, providing complete IT support , IT consulting and IT sales . Secure Networks ITC is an official Microsoft, Dell, Lenovo, WMWare, Bitdefender and Cisco partner, which means that we have constant access to latest technology and are able to offer you lower prices. We'll recommend top-of the-line Cisco VoIP phones at amazing rates that can be attached to both cloud and physical servers or recommend leading experts specializing in all aspects of phone systems, such as Avaya. Our services include helping you choose the right VoIP phone system for small business and completely taking care of the purchase, migration and implementation. That means that we'll handle everything from buying the right equipment, to contacting the old and new phone system provider to cabling and installation of the new phone system. We'll make your business phone system costs a part of one monthly IT invoice. If you already have one solution implemented, but are curious if it is the right solution for your business, contact us or give us a call! Our IT Consultant will be happy to provide explanation and advise the best possible option, FREE of charge!